"Why haven't you written a second novel?" This question is regularly posed to the successful, cynical and highly pragmatic Jep Gambardella (Toni Servillo), a man in his 60s who writes incisive interview pieces for a highbrow (pretentious) culture magazine. His first novel, or novella, The Human Apparatus, earned him an award and some reputation amidst Rome's elite some decades prior. An acquaintance of his observes, "You must have been incredibly in love when you wrote it." Love, motivation, purpose, identity, nostalgia and disappointment are just a few of the human identifiers floating around this self-conscious, expressionist extrapolation of a man's life. 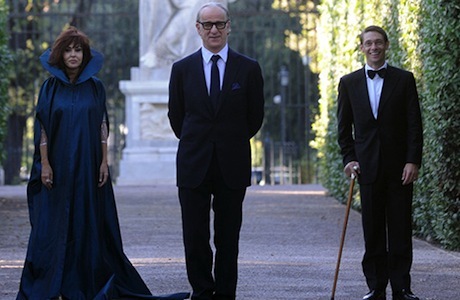 When The Great Beauty opens, sweeping camerawork and choral singers introduce the concept of travel as a means of establishing identity, leaving voiceover and music to give meaning and emotional context to the images of a Chinese tourist in Italy wandering off from the crowd and promptly dying (presumably) from a heart attack. This cinematic representation of the experience of living and the inevitability of death are then juxtaposed with a highly choreographed and stylized dance sequence — an elaborate performance, which, as we learn, is a metaphor for the projected identity of the litany of lost souls pretending to have it all figured out — that introduces the cast of characters. They writhe in unison while furious beats and vibrant colours exaggerate the assumed reality they inhabit. It's clear from the outset that Paulo Sorrentino (a director known for exploiting the idiosyncratic and observing, quite exquisitely, the inherent insanity and absurdity of the quotidian) has no interest in a linear plot or traditionalist narrative. The auteur is also hyper-aware that in creating an emotional tapestry, being vaguely arty about capturing the lives and essence of pretentious people, he's attempting to do something impossible. He's making a film about nothing and everything all at once, trying to shed a sliver of light on the existential void despite knowing that perception and purpose are forever fluid. Amidst this there's a basic plot, wherein Jep, a man known for tearing down the artifice people rely on to protect themselves while those around him quietly glance elsewhere, dates a friend's daughter, Ramona (Sabrina Ferilli), an aging stripper reluctant to rely on a man for support. He brings her to the many insipid and transparently performative Roman upper crust gatherings he attends, receiving scornful gazes and judgment from those whose lives are similarly in discord, looking to find arbitrary superiority wherever they can. While attempting to reclaim youthful passions with this younger woman, he reflects on the one love he lost years ago — a now deceased woman whose diary suggests she never fell out of love with him, despite fleeing from their brief romance. With constant stylization and abstract imagery (i.e., peripheral characters leap from bridges and an aging magician stands in front of a giraffe, primed to make it disappear), there's a sense of imposed perspective. The constant preoccupation with the female form similarly suggests that our view is distorted to reflect the experience of our embittered protagonist — ostensibly a disappointed optimist — constantly going back to the titular idea of finding the "great beauty." This search for passion, a love mirrored by the incisive commentary about the superficiality of Rome ("We're a country known for fashion and cuisine"), then becomes the basic trajectory of a story about a man surrounded by people putting on a show to mask their similar worldly discouragement. Smartly, it all goes back to the trajectory question: "Why haven't you written a second novel?" Because The Great Beauty is structured on feeling, implying concepts without necessarily telling them, it's open to dismissal and criticism, which makes it the sort of work that will divide audiences. Much of it depends on one's interest in escaping into a film rather than reacting to its discourse. Regardless, it's difficult to dismiss the intensity of the imagery on display. Even if an experimental treatise on the nature of existing within the vacuum of social insincerity doesn't appeal to everyone, the gorgeous shot composition and lyrical nature of it all are undeniable.